OCZ's new "Agility 2 E" are closing in fast and these "Extended" drives will offer more capacity at "almost the same" level of performance and pretty much the same price. Sandforce based SSDs have been flooding the market for quite some time and all secrets, as well as performance, are already out, so you might be aware of the thing called the "Spare Area". Sandforce SF-1200 based Agility 2 drive has 28 percent of NAND set as spare area and Anandtech was right on track when they were testing the firmware which reduces that number to 13 percent. The main question is the performance loss that happens once you get rid of the significant amount of spare area. Apparently, the performance penality is to small to be even bothered with and Anandtech showed that here. As far as we are aware, it's a matter of simple firmware update in order to get the Agility 2 to become Agility 2 Extended. 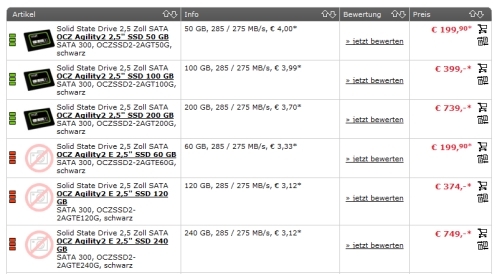 A quick search shows that this drive is actually already listed over at Alternate.de and according to our info, it should be announced quite soon and become available in mid May, or to be precise in next two weeks. The new drives will be available in 60, 120 and 240GB version, which is 10, 20 and 40GB more when compared to the "old" Agility 2 drive. We are still not sure if OCZ will offer this firmware update for those that have already bought the regular Agility 2 drive and/or if there are any "hardware changes" that OCZ is going to include with the Agility 2 Extended, but for now it looks like a simple firmware update. More space and pretty much the same performance for the same amount of money - what's there not to like?